Today is the day when President Elect Donald J. Trump will be inaugurated as the 45th President of the United States of America, and his wife Melania Trump will become the First Lady. Thinking of the changing political landscape in our country and the new First Family, I wanted to read a Bible story about a king and queen, so I read the intriguing Old Testament book of Esther last night and again this morning. Here are my thoughts from Esther. Does this king ever make his own decisions? I mean it is great that the king listens to his advisors and isn’t just a dictator, but the book of Esther rarely shows King Xerxes making any of his own decisions. He always just does whatever other people suggest to him, making him a flip-flopper on some important matters such as the destiny of all Jewish people. The early chapters of Esther are like a season of The Bachelor. As he searches for a new queen, the king has his servants find all the most beautiful virgins in the land (Ok maybe The Bachelor does not have many virgins, but you get the point. ), and after putting them through a year of beauty school he will pick the one he likes the best to become the new queen. God uses creative ways to protect the Jews. 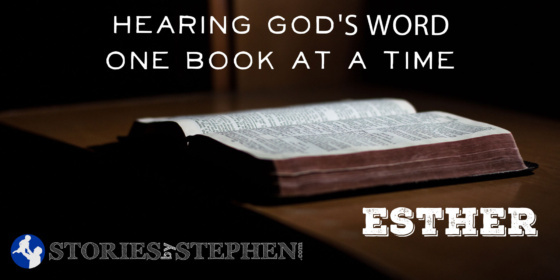 Esther’s story reminds me a great deal of Joseph’s story in Genesis. They both go from being nobodies to being close to their kings and gaining great deals of influence and power. They both use their high positions to save their people from certain death. Their relationships with their kings are obviously different, and Joseph saves the Israelites from death by famine, while Esther saves the Jews from death by genocide. However both were unlikely characters who God chose and promoted to influential positions so that when the time came, they would be able to help their people, God’s people. When it was apparent that her entire people would be wiped out, Esther had just one shot at influencing their pardon, but it did not come without risk. Apparently King Xerxes did not do a background check on his new queen since he did not even know she was Jewish, and following the advice of her cousin/adopted father Mordecai, Esther did not offer this bit of information to Xerxes until the time was right. Given the decree that all Jews would be put to death, there was risk that Xerxes would also have Esther put to death when he found out her heritage, but Esther also faced a huge risk just by approaching the king without being summoned. Esther was like a daughter to Mordecai, so obviously he did not want to send her to certain death, but he was a very smart and strategic man. He knew that if Esther did nothing, she would share the fate of all the other Jewish people, and while she was also risking her life by going to see the king without being called, Mordecai believed that God helped elevate her to queen for this very moment. Esther was scared, but she knew this was her moment of truth. This was the purpose of her life and all the preceding events were leading up to this time and place. Luckily for Esther, the king always thought she was extremely hot, and her beauty made the king happy to see her, even without permission. Not only was Esther beautiful, but she was graceful and intelligent in the way she spoke with King Xerxes. She played it cool and did not immediately beg the king for mercy upon her people. Rather she planned a banquet for the king, and after some good food and drink, then she would plead her case before King Xerxes. Esther knew that the way to a man’s heart was the attention of a beautiful woman, great food and delicious wine. She used her beauty and talent wisely, and it paid off. A series of events happened between the time Queen Esther invited the king to attend her dinner party and the night of the dinner. These events showed that Esther’s patience was also key to her plot, but more importantly it showed that God lined things up better than any human could have planned. While the Jews fasted and prayed for God’s intervention, God heard and answered their prayers. Haman was the hateful man behind the plot to kill all the Jews, and he had a really bad day that ended in him being impaled by the pole that Haman had setup to kill Mordecai. The king sided with Mordecai because Mordecai had previously uncovered a plot to kill the king, and the king listened to his queen. Even though King Xerxes had previously given Haman permission to have all the Jews gathered up and exterminated, Xerxes now found himself honoring the Jews and providing them protection and freedom. How quickly things can change! This really is an incredible story that would make a great movie. Well actually there was a recent movie made from this book, so maybe I will watch it on Netflix this weekend. When I was a 22 year old seminary student I needed a full-time job to support myself and pay my way through school. I was working a temp job for a few weeks, and it turned bad quickly. I felt that I had no option but to quit my temp job and trust that God would provide for me. I called Kelly Services to resign this temporary position, and I agreed to finish out the week. I left work that Friday with a huge feeling of relief that I could move on from that job, and I felt a sense of peace that I would find other work quickly. As I left the building and walked across the parking lot, before I even got into my car, I got a phone call from a company who I had previously worked for part-time during college. Right there on the spot I was offered a full-time job with health insurance, great benefits and very fair pay for that type of position. I worked there for 3 years, and that job provided for me through seminary, through our first 2 years of marriage and through the birth and early months of our first son Will. When I accepted a children’s ministry position in Kokomo, Indiana, Jennifer and I moved our family 500 miles away from our families in January 2013. As we prepared for this major move, we made a quick trip to look at houses in Indiana. Because of our schedule, we literally only had 1 day to find a house. We tried to do as much of the house-hunting online as we could, and we had several houses picked out to see in person with our realtor. This was our first time buying a house, and we felt really discouraged after looking at all the houses on our list. Nothing was as nice in person as it looked online, and none of the houses felt like the right home for our young family. We were at a loss for what to do next. Since we have 3 kids we were looking at 4-bedroom houses, but at this point we decided to consider 3-bedroom houses, as we figured the boys could share a room. It was getting late in the afternoon of an already long day, but after a quick online search of 3-bedroom houses, we found just one that we had time to see. After one quick walk-through Jennifer and I just knew that this was the house that would be our home. It was a beautiful little house in a nice, quiet neighborhood. It backed up to a neighborhood pond, and it was only 1.3 miles from the church. It turned out that the house had been under contract to another buyer, but their financing had fallen through just that morning. The seller was living out-of-state and was very frustrated and ready to get rid of this house. We made an offer a few thousand below asking and quickly had our offer accepted. We got a great deal on a great house that would be a great home for our family during the 2.5 years we lived in Indiana. We knew God’s hand was involved in the whole thing. Finally, when it was time to leave Indiana and bring our family back to Guntersville, Alabama in summer 2015, God could not have lined things up more smoothly for us as we sold the same house I just wrote about. Immediately after we announced to the church that I was stepping down as children’s minister, we put our house on the market with a great local realtor. Our house was listed publicly for only 3 days, and we only had 2 showings. The 2nd showing made a full-asking-price cash offer, and just like that our house was sold. Not only did our house sell near-instantly, but we sold it for $20,000 more than we had paid for it just 30 months earlier. I have heard plenty of horror stories from other people selling their houses, but our experience was almost unbelievable except that we and others had been praying about it quite a bit. We knew that this move was the right thing at the time, and every step of the way God just lined things up for us. I finish writing this as I watch the Presidential Inauguration on TV, and I cannot help but wonder, hope and pray about God’s involvement in Trump’s presidency. Our country is currently in a rough place. Racial division is the worst I have seen in my lifetime. Political division is even worse as the divide between conservatives and liberals seems to be widening every year. Our healthcare needs improvement and reform once again. Our economy continues to struggle as it has done my entire adult life. Our nation is under constant threat from terror organizations, and we are at war on multiple fronts. If there is ever a time in our nation’s history where we need God to intervene and align some things for the betterment of America and really for the betterment of the entire world, the next 4 years would be a great time for God to do that! I like some of Trump’s potential policies, but I sure with he could keep his foot out of his mouth and maybe take a long vacation from Twitter. I think President Trump is a wildcard, and none of us really quite know what to expect. What I do expect is for Christians across America to lift up Trump and the USA in our prayers daily and hope that God is lining things up for a successful presidency and an improved America. Even beyond the political and economic needs, I will pray that God will bring about a spiritual revival in our country. As much power as he now has, Donald Trump cannot, by himself, “Make America Great Again,” but collectively with the guidance and help of God, maybe, just maybe, we can be a truly great nation.